With the warmer weather is starting to wear clothes that leave open the neck and decollete. What better time to splurge on several occasions necklaces with precious stones? A jewel that is atto give a special touch to any look, from the most informal to the most elegant, in fact in every season. In summer, However, you can multimillion-depending on the time: it’s an aperitif on the terrace or an elegant evening, wear the right necklace always adds something extra to clothing. All the best fashion houses offer models of high prestige; here some where precious stones are major players. 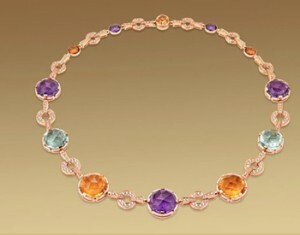 Necklaces, necklaces, pendants, the important thing is that they are splendid jewels. The signatures of fine jewelry are always careful to play with precious stones to create color contrasts and create forms that combine design and fit. A small gallery of necklaces that will enhance your look. A collection inspired by the colors of the Mediterranean, Which Expresses the joy of summer and remember the scent of homegrown beaches. The Mediterranean Eden Bulgari necklace is inspired by the atmosphere of the Mare Nostrum: 18-carat yellow gold, features zaffirii fancy, peridot, amethyst and diamonds, with diamonds in the rings in gold price (23 thousand euro). Cocktail collection in parenthesis the necklace that bears the name of the line he chose the 18-carat pink gold as the basis on Which they are mounted green quartz, citrine, amethyst and pave diamonds (price € 29 thousand). Classic and ancient references to the crown pendant 18 carat white gold with diamonds: inspiration comes from the crown and flowers, symbols of glory and celebration since ancient times (price on request-depending on the carat weight of the diamond) Chanel, the collection as a tribute to Coco Chanel. Coco Chanel changed the image of the woman, giving her a freedom of expression in clothing And Also celebrating the beauty of women in all its splendor. 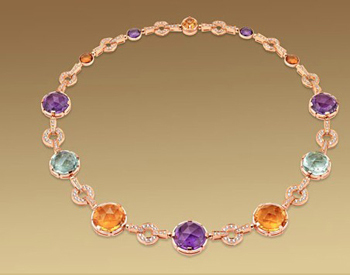 Among the models proposed by the fashion house fine jewelry is a must Collier Etoile Filante. The new interpretation of the original Collier Comete original created in 1932 by the designer lives in a contemporary classic Chanel, where the beauty of the stone meets creativity. A cascade of wires adorned with baguette diamonds that are the culmination of the star in diamonds, to be placed on the shoulder or chest, in a quest for freedom of expression dear to Coco Chanel. A tribute to the genius of Coco Mademoiselle in honor of the 80th anniversary of the first line of fine jewelry of the house. How to give up a jewel Tiffany? The jewelry offers several models of necklaces and pendants. In Particular the latter are really suitable for any time of the day, beautiful to wear even in simple and iconic. Some designs, However, require a special moment to be sported as the Tiffany Swing necklace in platinum, where the round brilliant diamonds chase throughout the jewel (price € 18.755). Diva model fringed necklace in diamonds and platinum three-wire with round diamonds, marquise-cut and cushion, alternating to show their forms (price 563 mila euro). Finally, the model Monarque Jean Schlumberger, inspired by the designer’s passion for horticulture, with flowers and leaves of his own garden shooting for his creations. Here a butterfly in 18k gold with yellow sapphires flying between leaves of platinum and diamonds (price € 145 thousand).